Reprise: Is the Ruger LCR a perfect concealed carry revolver? Prompted by my friends over at the Liberal Gun Club, this is another in an occasional series of revisiting some of my old articles which had been published elsewhere over the years, perhaps lightly edited or updated with my current thoughts on the topic discussed. This is an article I wrote for Guns.com, and it originally ran 5/3/2012. Some additional observations at the end. The Sturm, Ruger & Company line of LCR composite-frame revolvers have been available for a few years now (2009) and since expanded from the basic .38 Special that weighs 13.5 ounces, to a 17-ounce version that can handle full .357 magnum loads, and a slightly heavier one that shoots .22 Long Rifle. Ruger makes excellent firearms and I have grown up with them, but I was more than a little skeptical at the prospect of a revolver with a composite frame when I first heard about it. And the initial images released of the gun didn’t belay my skepticism. But then the first Ruger LCR revolvers were actually introduced and I found out more about them. The frame is actually only partly composite while the part that holds the barrel, cylinder, and receiver is all aluminum. The internal components like the springs, firing pin, trigger assembly, et cetera are all housed in the grip frame and are well supported and plenty robust. My skepticism turned to curiosity. When I had a chance to actually handle and then shoot the LCR, my curiosity turned to enthusiasm. Since then, having shot several different guns of both the .38 Special and .357 LCR models, I have become even more impressed. Though I still think the LCR is somewhat lacking in the aesthetics department. But in the end it does what it is designed to do. 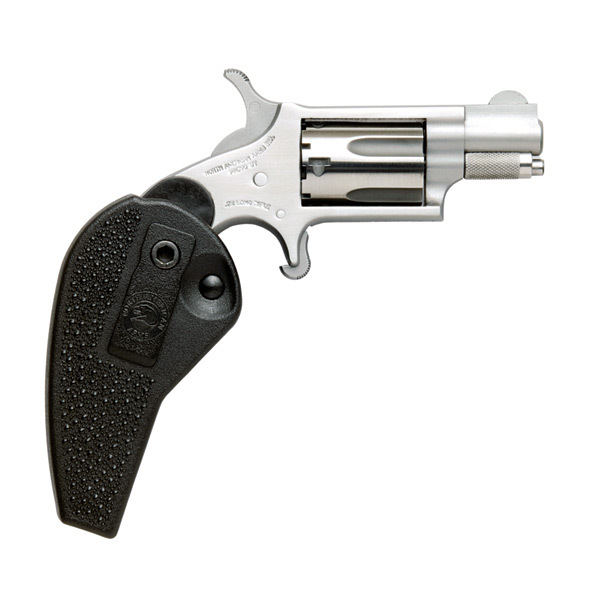 Like the S&W J-frame revolvers, the models it was meant to compete with, the LCR is an excellent self-defense tool. It’s virtually the same size as the J-frames and the weight is comparable (depending on which specific models you’re talking about). So it hides as well in a pocket or a purse because it has that same general ‘organic’ shape. 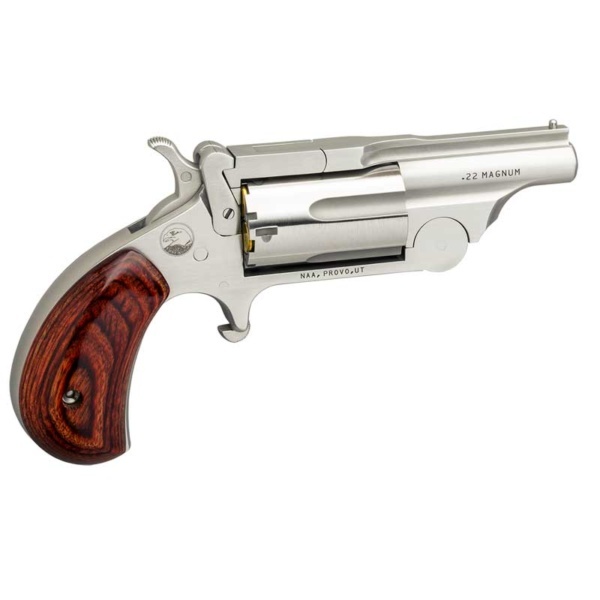 The difference is, the LCR is, if anything, even easier to shoot than your typical J-frame Double Action Only revolver (DAO, where the hammer is cocked and then fired in one pull of the trigger). I’m a big fan of the Smith & Wesson revolvers, and I like their triggers. 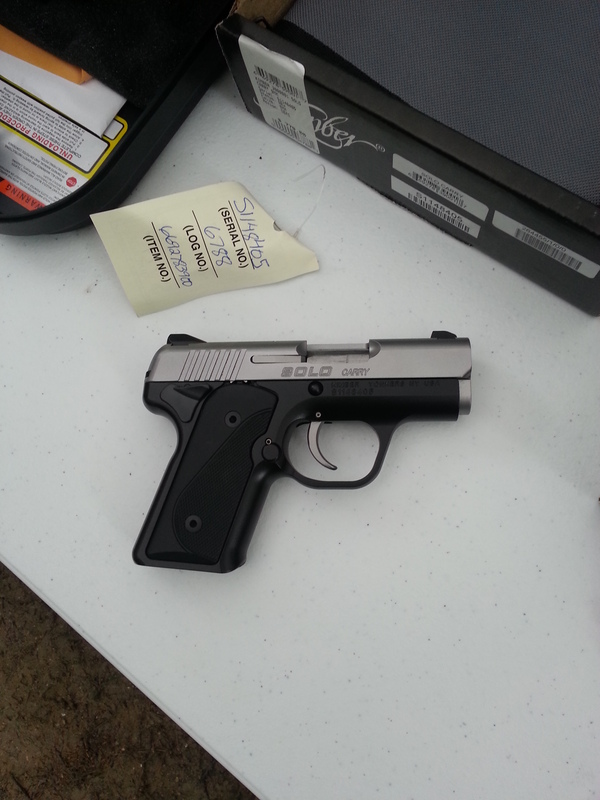 But the LCR has a buttery smooth, easy-to-control trigger right out of the box, which is as good or better than any S&W. Good trigger control is critical with a small DAO gun and makes a world of difference for accuracy at longer distances. I would not have expected it, but the LCR is superior in this regard. Like any snub-nosed revolver, the very short sight radius means that these guns can be difficult to shoot accurately at long distance (say out to 25 yards). But that’s not what they are designed for. They’re designed to be used at self-defense distances (say out to seven yards). And like the J-frame DAO models, even a new shooter can become proficient quickly. I consider the .38 Special model sufficient for self defense. It will handle modern +P ammo, something quite adequate to stop a threat in the hands of a competent shooter. And the lighter weight is a bit of an advantage. But there’s a good argument to be made for having the capability to shoot either .38 Special or .357 magnum cartridges. My only criticism of the LCR line is that they haven’t yet been around long enough to eliminate potential aging problems. All of the testing that has been done suggests that there won’t be a problem and I trust that, but only time will truly tell if they hold their value over the long haul. It’s been six years since I wrote this, which means the early versions of the LCR have now been around for almost a decade. And as far as I know, there hasn’t yet been a widespread problem with them holding up to normal, or even heavy, use. So much for that concern. And Ruger has (wisely, I think) expanded the cartridge options for the LCR even further. You can still get the classic 5-shot .38 Special and .357 Magnum versions, as well as the 6-shot .22 Long Rifle one. But now you can also get 6-shot .22 Magnum or .327 Magnum versions, as well as a 5-shot offering in 9mm. Each cartridge offers pros and cons, of course, as well as plenty of opportunity for debate using data from BBTI. Just remember that the additional of the cylinder on a revolver effectively means you’re shooting a 3.5″ barrel gun in the snubbie model, according to our charts. Personally, I like this ammo out of a snub-nosed revolver, and have consistently chono’d it at 1050 f.p.s. (or 386 foot-pounds of energy) out of my gun. I like both the flexibility of operation and the aesthetics better than the original hammerless design. But that’s personal preference, nothing more. The LCR line has also now been around long enough that there are a wide selection of accessories available, from grips to sights to holsters to whatever. Just check the Ruger Shop or your favorite firearm supply source. So, a perfect pocket gun? Yeah, I think so. Also good for a holster, tool kit, or range gun. Reprise: When is a Magnum not really a Magnum? Prompted by my friends over at the Liberal Gun Club, this is another in an occasional series of revisiting some of my old articles which had been published elsewhere over the years, perhaps lightly edited or updated with my current thoughts on the topic discussed. This is an article I wrote for Guns.com, and it originally ran 6/5/2013. Some additional observations at the end. Those are all claims taken right off of the box of three different boxes of .22 Magnum (technically, the .22 Winchester Magnum Rimfire cartridge) ammo. And when you see numbers like those, it’s really easy to get excited about how much more powerful the .22 Magnum is over your standard .22 LR. But what do those numbers really mean? And can you really expect to get that kind of performance? Do you get a different kind of performance out of your rifle than you get out of your little revolver? That’s one of the reasons that our Ballistics By The Inch project exists: to find out just exactly what the reality of handgun cartridge performance is, and to see how it varies over different lengths of barrel. And the first weekend of May, we did a full sequence of tests of 13 different types of .22 Magnum ammo to find out. About four years ago we started testing handgun cartridges out of different lengths of barrel, using a Thompson/Center Encore platform, which has been altered to allow a number of different barrels to be quickly mounted. The procedure is to set up two chronographs at a set distance from a shooting rest, and fire three shots of each type of ammo, recording the results. Once we’ve tested all the ammo in a given caliber/cartridge, we chop an inch off the test barrel, dress it, and repeat the process, usually going from an 18-inch starting length down to 2 inches. The numbers are then later averaged and displayed in both table and chart form, and posted to our website for all to use. For those who are interested in the actual raw data sets, those are available for free download. To date we’ve tested over 25,000 rounds of ammunition across 23 different cartridges/calibers. 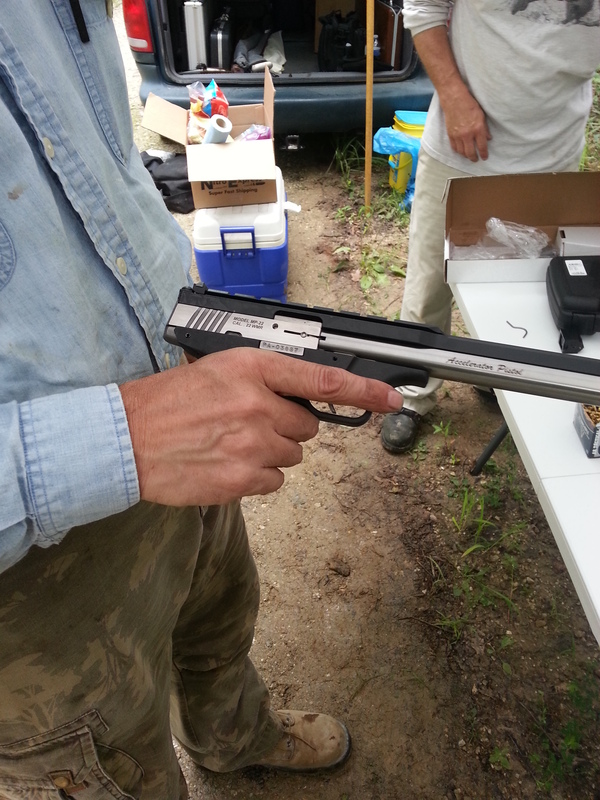 To do the .22 Magnum tests things were slightly different. 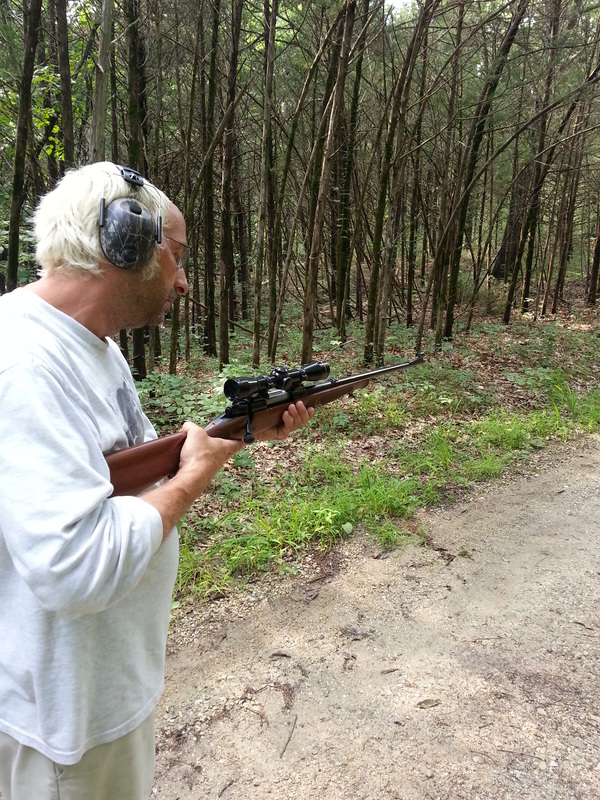 We started with a Thompson .22 “Hot Shot” barrel and had it re-chambered to .22 Magnum. Since this barrel started out 19-inches long, we included that measurement in our tests. So, how did the .22 Magnum cartridge do? See those claims from manufacturers at the top of this article? Two of the three were supported by our test results. The third was not. Data sheet from the test. I don’t want to pick on those specific brands/types of ammo, though. I just grabbed three of the boxes we tested at random. Altogether we tested 13 different brands/types of .22 Magnum ammo, and let’s just say that the performance you actually see out of your gun will probably vary from what you see claimed from a manufacturer. Now, that’s not because the ammo manufacturers are lying about the performance of their ammo. Rather, the way they test their ammo probably means that it isn’t like how you will use their ammo. This is most likely due to the fact that the barrel length and testing conditions are pretty different than your typical “real world” gun. So, what can you expect from a .22 Magnum cartridge? Well, that pretty much depends on how long a barrel you have on your gun. Most handgun cartridges show a really sharp drop-off in velocity/power out of really short barrels. 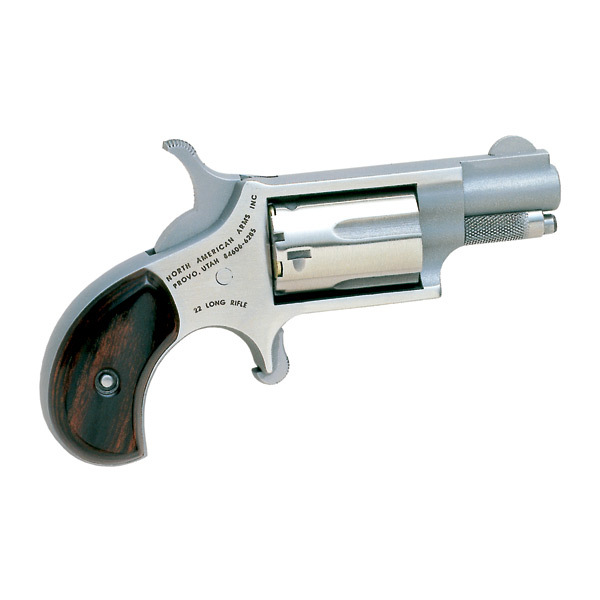 Typically, going from a 2- to 3-inch barrel makes a bigger difference than going from a 3- to 4-inch barrel. Also typically, most handgun cartridges tend to level out somewhere around 6 to 8 inches. Oh, they usually gain a bit more for each inch of barrel after that, but the increase each time is increasingly small. The real exception to this, as I have noted previously, are the “magnum” cartridges: .327 Magnum, .357 Magnum, .41 Magnum and .44 Magnum. The velocity/power curves for all these tend to climb longer, and show more gain, all the way out to 16 to 18 inches or more. There are exceptions to all these rules, but the trends are pretty clear. So, does the .22 Mag deserve to be listed with the other magnum cartridges? Well — maybe. 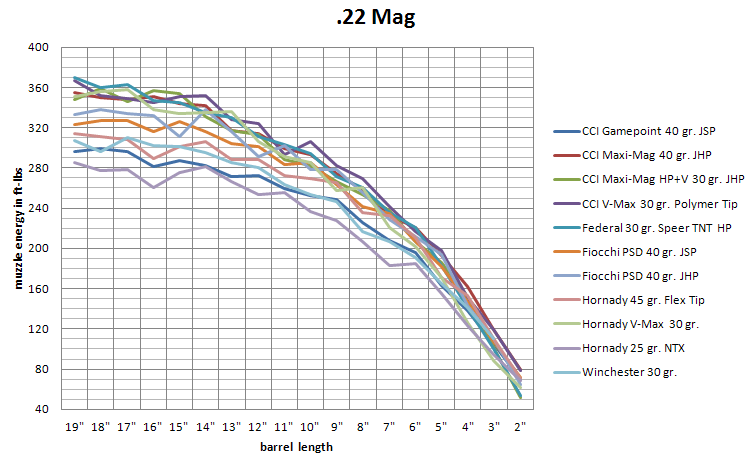 Compared to the .22 LR, the .22 Magnum gains more velocity/power over a longer curve. But it also starts to flatten out sooner than the other magnums — usually at about 10 to 12 inches. Like most handgun cartridges, there are gains beyond that, but they tend to be smaller and smaller. For me, the take-away lesson from these tests is that the .22 Magnum is a cartridge that is best served out of rifle barrel, even a short-barreled rifle. At the high end we were seeing velocities that were about 50 percent greater than what you’d get out of a similar weight bullet from a .22 LR. In terms of muzzle energy, there’s an even bigger difference: 100 percent or more power in the .22 Magnum over the .22 LR. But when you compare the two on the low end, out of very short barrels, there’s very little if any difference: about 10 percent more velocity, perhaps 15 percent more power. What you do notice on the low end is a lot more muzzle flash from the .22 Magnum over .22 LR. As you can see, there’s not a whole lot of rifling past the end of the cartridge when you get *that* short. While you do see a real drop-off in velocity for the other magnums from very short barrels, they tend to start at a much higher level. 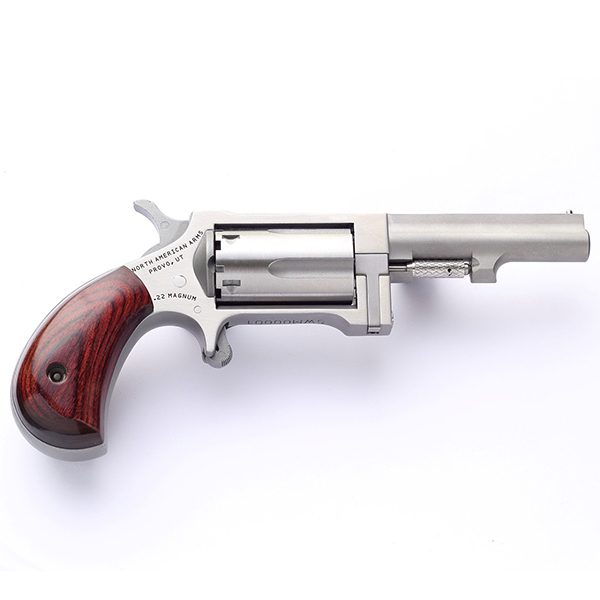 Compare the .357 Magnum to the .38 Special, for example, where the velocity difference is 30 to 40 percent out of a 2-inch barrel for similar weight bullets, with a muzzle energy difference approaching 100 percent. Sure, you get a lot of noise and flash out of a .357 snubbie, but you also gain a lot of power over a .38. 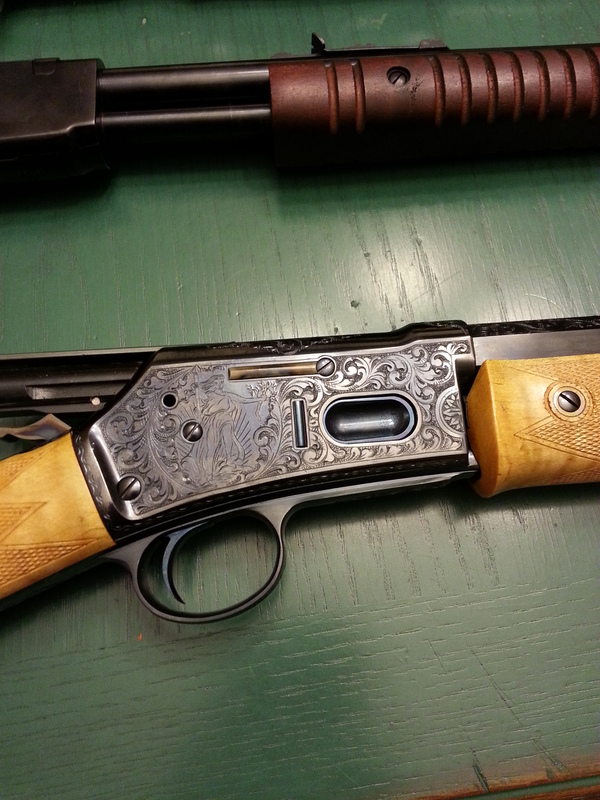 But then there’s the curious case of the Rossi Circuit Judge with an 18.5-inch barrel, chambered in .22 Magnum. You see, it only performed as well as my SAA revolver with the 4.625-inch barrel. This was so completely unexpected that we thought we had to have made a mistake, or the chronos were malfunctioning, or something. So we went back and tested other guns for comparison. Nope, everything was just fine, and the other guns tested as expected. So we made a closer examination of the Rossi and it just goes to show where there’s a rule, there’s an exception. Yup, there’s a good reason why it was giving us the readings it was. And I’ll reveal why when I do a formal review of that gun. OK, first thing I want to say: the reason the Circuit Judge performed so poorly was that it had a forcing cone the size of a .357 magnum on it, either allowing far too much gas to escape as the bullet made the transition from the cylinder to the barrel or because the chamber was so badly out of alignment with the barrel that it was necessary for the bullet to be guided into the barrel by first striking the side of the cone. Either way, it was a problem. Next thing: since I wrote this 4+ years ago, I have seen countless examples of people insisting that even a little NAA .22mag pistol is MUCH more powerful than the .22lr version. This is not to dis the .22mag. It’s a fine cartridge — in the right application. For me, that means out of a rifle. And there are good reasons to have a handgun chambered in .22mag, such as ammo compatibility with a rifle or just flexibility in ammo availability in the case of a convertible revolver like the one I have. Just understand what the real advantages and disadvantages actually are before you make a decision. Well, well, well, BBTI made it to six years of shooting fun and research! Yup, six years ago today we posted the first iteration of Ballistics By The Inch, and included data for 13 different handgun cartridges. Since then we’ve continued to expand on that original research, including some extensive testing on how much of an effect the cylinder gap on revolvers has, what performance differences you can expect from polygonal over traditional land & groove rifling, and added another 9 cartridges, as well as going back and including a very large selection of real world guns in all the different cartridges. This blog has had 100,000+ visitors and the BBTI site itself has had something like 25 – 30 million visits (the number is vague because of changes in hosting and record-keeping over time). We’ve had an impact. I’ve seen incoming links from all around the world, in languages I didn’t even recognize. 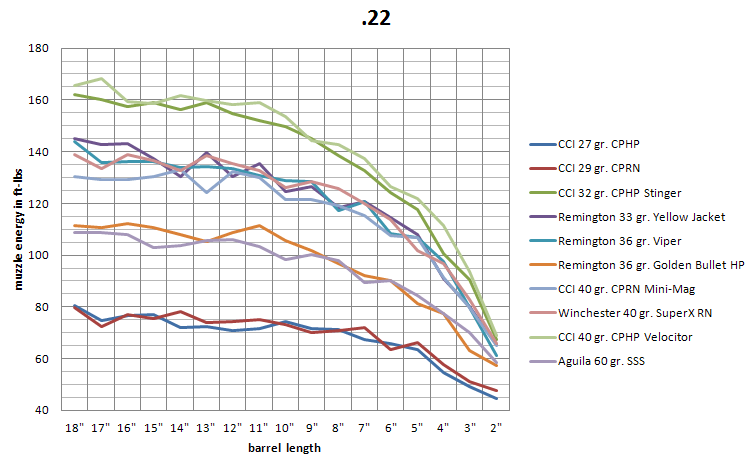 There’s probably not a single firearms discussion group/blog/site out there which hasn’t mentioned us at some point, and our data is regularly cited in discussions about the trade-offs you make in selecting one cartridge or barrel length over another. I’ve answered countless emails asking about specific points in our data, and have been warmly thanked in return for the work we’ve done. And on more than a few occasions people have pointed out corrections which need to be made, or offered suggestions on how we could improve the site, sometimes providing the results from their own crunching of our data. When we started, it was fairly unusual to see much solid information on ammo boxes about how the ammunition performed in actual testing. Now that information is common, and expected. Manufacturer websites regularly specify real performance data along with what kind of gun was used for that testing. And the data provided has gotten a lot more … reliable, let’s say. We’ve been contacted by both ammo and firearms manufacturers, who have asked if they can link to our data to support their claims of performance — the answer is always “yes” so long as they make it clear that our data is public and not an endorsement of their product. And we’ve never taken a dime from any of those companies, so we can keep our data unbiased. And we’re not done. We have specific plans in the works to test at least one more new cartridge (and possibly revisit an old favorite) in 2015. I try to regularly post to the blog additional informal research, as well as sharing some fun shooting and firearms trials/reviews. There’s already been one firearms-related patent issued to a member of the BBTI team, and we’ll likely see several more to come. Because we’re curious guys, and want to share our discoveries and ideas with the world. So, onward and upward, as the saying goes. Thanks to all who have cited us, written about us, told their friends about us. Thanks to all who have taken the time to write with questions and suggestions. And thanks to all who have donated to help offset the ongoing costs of hosting and testing — it makes a difference, and is appreciated. 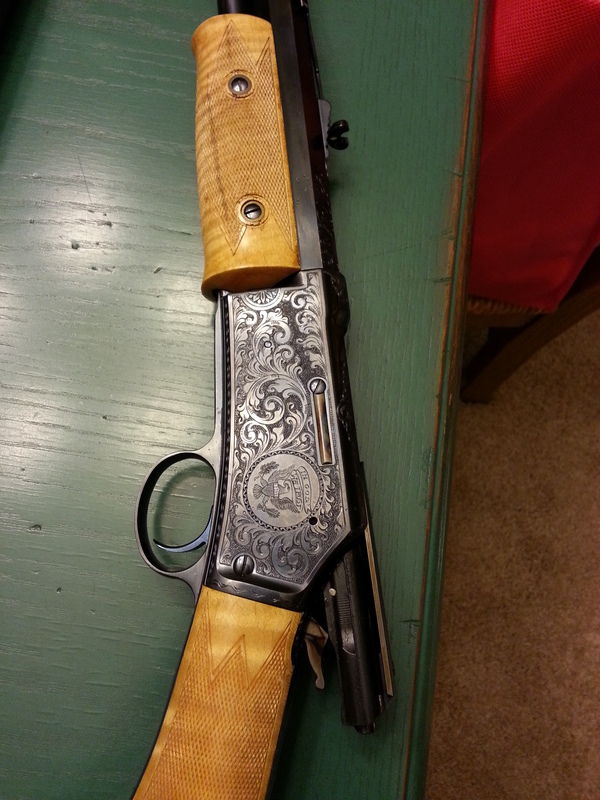 If you check those links, you’ll see that I have written formal reviews for both the Uberti and the USFA previously. So I won’t spend much time talking about them. But the little Taurus deserves a quick review. Because I found it to be a *very* nice little pump gun. The action was slick and didn’t have any problems, even though it was basically brand new. The Buckhorn sights are classic for a reason: they’re intuitive and work very well at modest distances. And even though the gun is relatively lightweight (compare the neck of the stock to the other two pump rifles above), there’s more than enough mass there to tame the recoil from the .22magnum cartridge. That means that you can get very quick and tight groups out of it even just standing and shooting it unsupported. 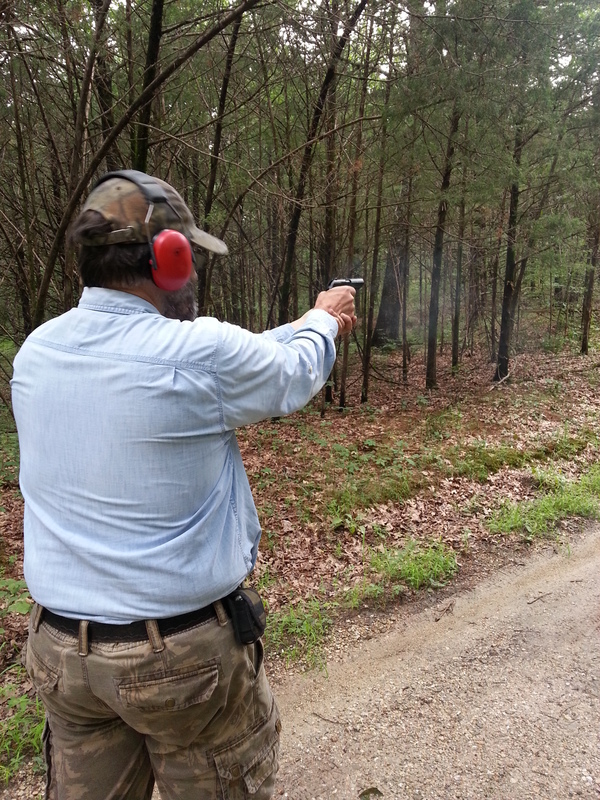 Shooting it is just a blast, though one which doesn’t come with a lot of muzzle flash. I *do* like pump guns. 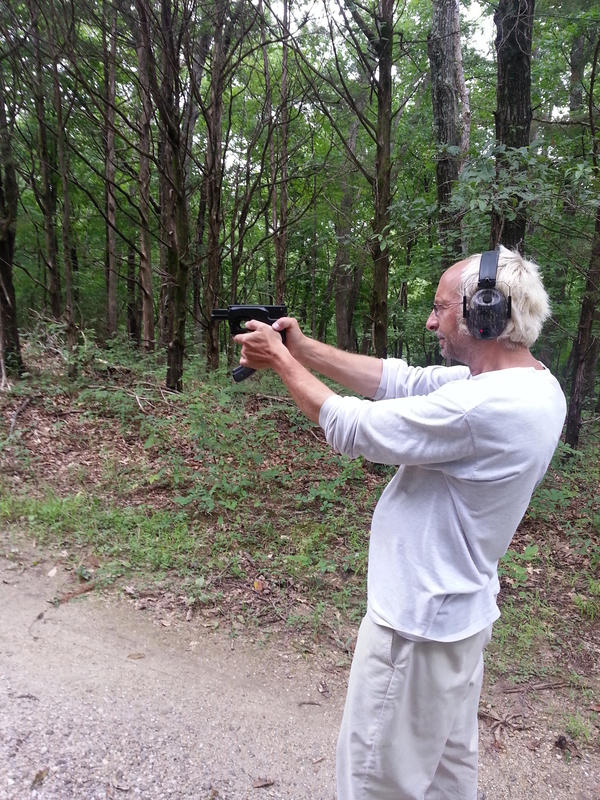 That’s one of the other BBTI guys shooting a Kel-Tec PMR-30 last weekend. How was it to shoot? Actually, pretty nice. Has a surprisingly good trigger. In general, I like Kel-Tec guns for what they are: reasonable quality at a very affordable price. And I downright love my Sub-2000 in 9mm. But I won’t be getting a PMR-30 anytime soon. Because at the 4.3″ barrel length, it just doesn’t take real advantage of the .22WMR cartridge — you only get about a 20% improvement over a .22lr cartridge. Unless you like making fireballs. *With apologies to Jerry Lee. And now for some newer guns. Last week I posted about some historical reproductions. 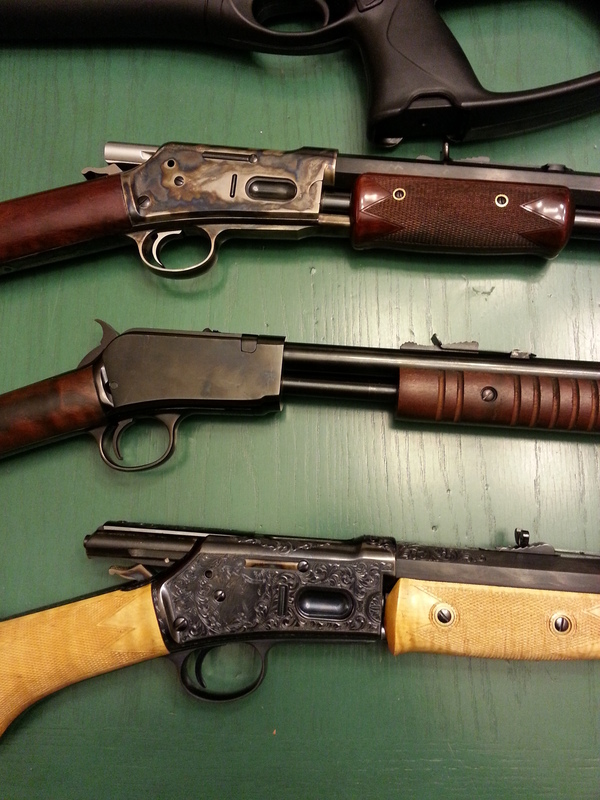 Now let’s have a quick overview of some newer guns we got to try on the same trip to the range. I’ll include some *very* brief comments, and may return to do longer reviews later when I have some additional time. Comments: Ugh. I hated this gun. Seriously. It’s awkward to hold, worse to shoot, all sharp angles and weirdly thick. It’s the kind of ugly that isn’t even interesting. The design requires you to put your hand right up close to the muzzle to cycle the action. Since it was brand new, I’ll forgive it having problems cycling properly (this is fairly common with rim-fire guns which are brand new), but I sure as hell wouldn’t want to have to shoot it enough to break it in. Bottom line: if someone insisted on giving me one of these, I’d just turn around and sell it to use the money for almost any other purpose. Comments: I did not expect to like this gun. I was REALLY surprised when I did. 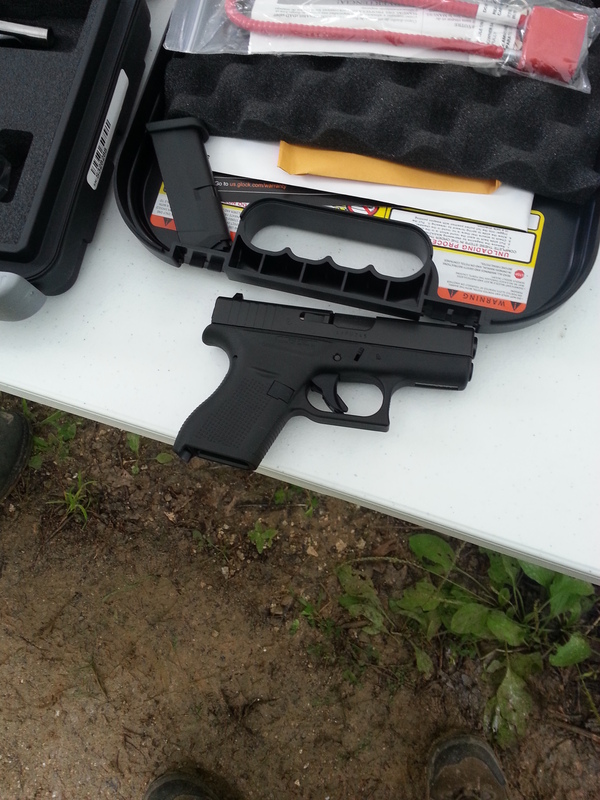 Seriously, it is the best-shooting Glock I’ve ever handled. For such a small gun, it fit my large hands comfortably and was easy to shoot well. With Glock quality and reliability, this may be the first .380acp I would seriously consider as a CCW gun. Comments: Kimber quality. Lot of power in a small package, and I felt it in the web between thumb and forefinger of my dominant hand. But that was just a sting, not uncomfortable, even shooting premium SD ammo. Another good candidate for CCW. Comments: Like I said, a classic. And as such, a known quantity. 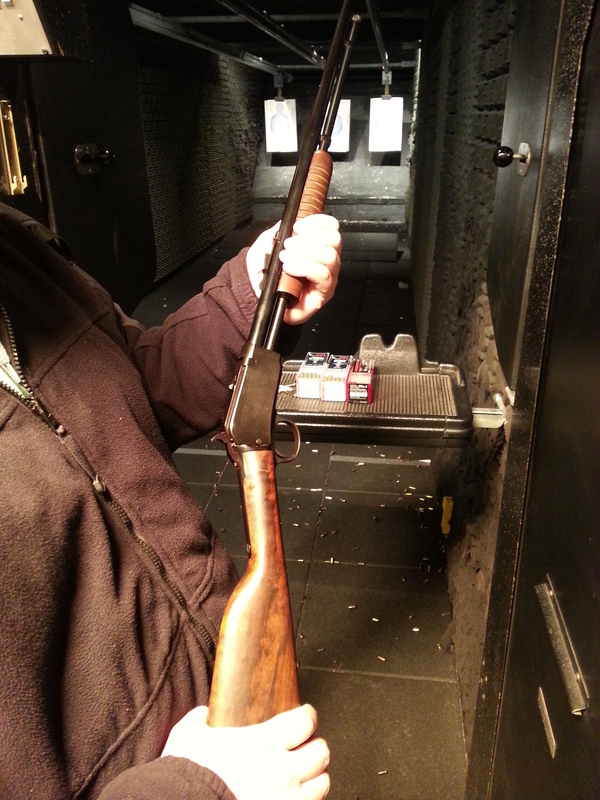 But the first time I’ve shot one in 6.5 Swede, and I was pleasantly surprised by how little recoil there was. Well, that’s all that I have images of, though we also shot a Chiappa M1-22 and a KelTec PMR-30 .22 mag. Again, both are known quantities and shot as expected. Oh, and my buddy gave my Steyr S9 a go, and you can see that vid here. As noted, I may revisit any of these with a longer review sometime later, but don’t hold your breath. On this show I was lucky enough to round up three guys uniquely qualified for the first ever Rimfire Roundtable. We discuss what we would like to see come from the firearms industry regarding rimfire, better supplies of ammunition aside. I hope you enjoy our discussion and let us know your ideas too. It’s about an hour long, all told, and in spite of my participation fairly interesting/informative. Check it out if you have some listening time! For me, the take-away lesson from these tests is that the .22 Magnum is a cartridge that is best served out of rifle barrel. At the high end we were seeing velocities that were about 50 percent greater than what you’d get out of a similar weight bullet from a .22 LR. In terms of muzzle energy, there’s an even bigger difference: 100 percent or more power in the .22 Magnum over the .22 LR. Go check out the whole thing! Ammo shortage? What ammo shortage?? Oh — THAT — ammo shortage. Yeah, the beginning of January I wrote that we were finally moving forward with the testing of polygonal vs. traditional rifling; the so-called “Glock Tests“, and outlined how we were planning on conducting a bit of an experiment in asking for suggested ammo loads to include in the tests, and then seeing what kind of support there was for a slate of different choices by allowing pledges to help purchase ammo. But, as someone who wrote me put it: where did we think we were going to *find* any such ammo? Initially, I thought that the shortage we were seeing would be a fairly temporary problem, and that by the time spring rolled around we’d be able to locate sufficient quantities for our testing (we need about 350 rounds of each type). Yeah, so much for that idea. Now you know why I don’t play the stock market or bet on races. The ammo shortage has just continued to deepen. It’s to the point where people are having a hard time finding enough of any kind of ammo just to keep in practice with a trip to the range once or twice a month. I’m damned glad I reload my practice ammo, and have a decent store of most components. But that doesn’t do a damned thing for our testing. The whole idea is to test factory ammo, not some cobbled-together handload version of factory ammo. 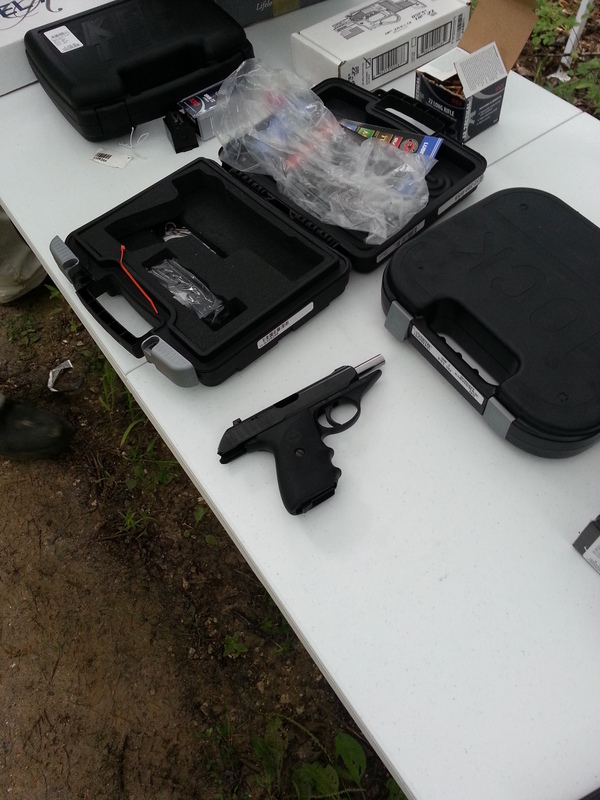 So we’re putting off the “Glock Tests” again, until the situation gets better. Keep an eye here and elsewhere for news about when this will change. One good bit of news, however: we already had a decent selection and sufficient quantity of each ammo type to do the .22WMR (.22Magnum) tests. So we’re going to go ahead and do that sequence of tests here this spring — sometime soon! Sorry for the bad news, everyone — really. These tests have been delayed several times for one (good) reason or another, and we’re just as frustrated by that as everyone else. But when ammo supplies start to become more available, we’ll be sure to try and get them done as soon as we can.